A new round of N-21 opened up yesterday and I’m enjoying all of the things so far. Tattoo – Bolson @ The Mens Dept. Uber has opened a new and glorious round called “Street Style” and people have really outdone themselves this round with creating some great items. This entire outfit I have on is one of my favorites right now so I wanted to show it off as well as the Moon hair that is at Uber, I’m really enjoying Moon hair lately. I’m really enjoying this round of N21! The Men’s Dept is now open and May looks to be a really nice round of new things that you can use to dress up your Male avatar and they even have some things for the ladies too. 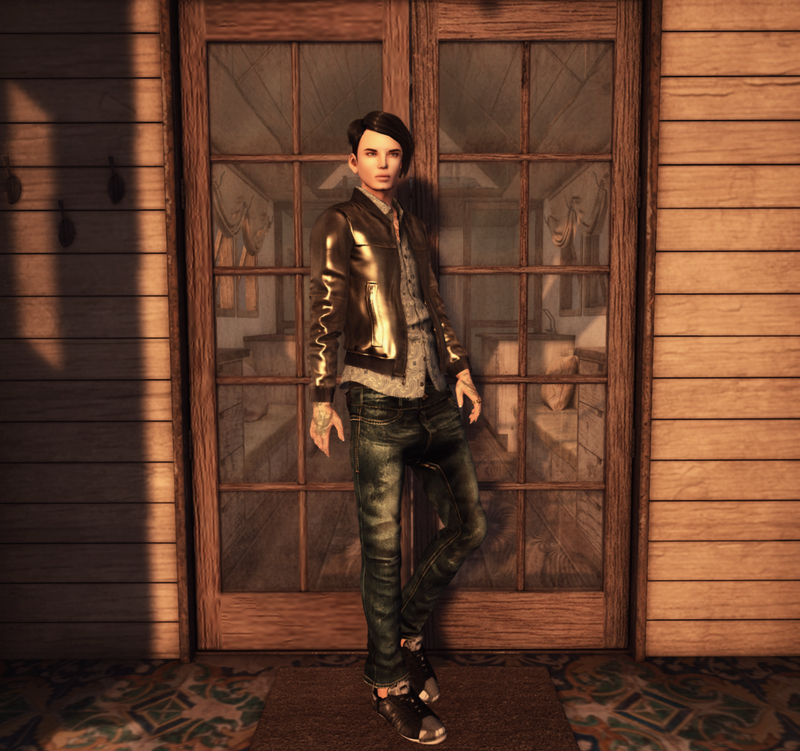 I am really liking stuff from Addams lately and this leather jacket shirt combo comes with a hud where you can change the textures on the shirt and the materials on the jacket are pretty awesome. I also want to mention that at a different event (Fameshed), Junk. has released a compact and adorable living space that you should go check out as soon as possible. I’ll take different photos of it soon but I thought it worked well as the background for my photo. Happy Monday! Here I am at the Little Bones Sim trying to take a photo for a contest they are having. You can read about that here. They hair that I am wearing is at Uber this round. You have a limited amount of time to go and pick that up! The clothing that I am wearing is from Collabor88’s Pretty in Punk round. The dress is from Emery, the maitreya body applier leggings are from Erratic and the shoes, the fabulous shoes are from Remarkable Oblivion. Just a simple look really but I like it. My skin is the Glam Affair – Katra skin also from this round of Collabor88. My jewelry is from Yummy and my tattoo is from Bolson. A few days ago the Men’s Dept. opened and my male alt, Case got a little bit spruced up. I really like these pants for him from Reverie along with this hoodie from Not So Bad, The Men’s dept is great for guys as everything is priced between 100-300L. The pose that I’m using is from Ooo Studies and is also from the Men’s Dept. this round and the house in the background is the gacha farmhouse from Apple Fall. I got a bad desire.. I didn’t go typical sports photo with this bench and hockey lamp from Junk. which is at the Men’s Dept. right now (this set also includes some vintage sports photos) for the March round. I kinda gave it my own spin. I imagine that stars are being collected from the background of the night sky and saved in these little jars which were a New Years group gift from Vespertine. Collabor88 also started today and Tableau Vivant is offering up this fabulous hair which I will get a ton of use from. These shoes, which I really love are from Candy Doll. – also at Collabor88 this March round. My tattoo is from Bolson’s main store and my skin as usual is from Glam Affair. My pose is from Flowey. The March round of the Men’s Dept. is well under way. First I had to blog these sweatpants. They come in two versions – “eggplant” which is shown and regular. Of course I went with the “Eggplant” version. Of course. Xin made these sweatpants and I think that they are very funny and definitely a conversation starter. Case is also wearing a new tattoo from Bolson which you can also get at TMD this round. Case’s hair is new from Taketomi.